ISLAMABAD: Pakistan on Thursday said it will approach the United Nations Security Council (UNSC) if India changed the autonomous status of the Indian-Held Kashmir (IHK). Even as India went to the polls Thursday, Pakistan reiterated that it had effective intelligence about an impending Indian attack on Pakistan in mid-April, and that is why it was stated publicly by Foreign Minister Shah Mehmood Qureshi. 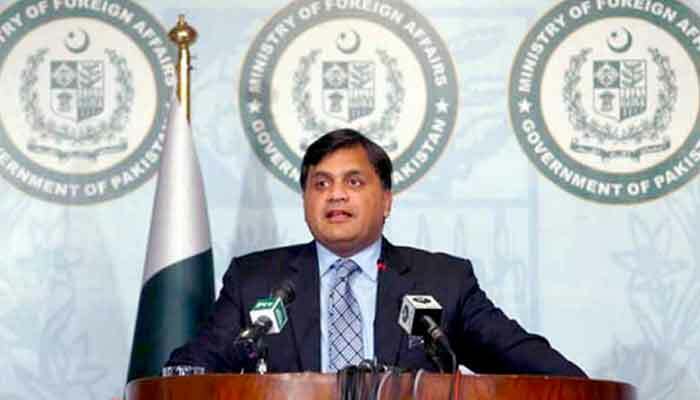 “Pakistan retaliated against Indian aggression with its own strength without involving any other force on Pulwama incident and any future threats from India will be dealt with the same intensity by Pakistan,” Spokesman at the Foreign Office told the media during the weekly briefing. Over the weekend, Qureshi during a press conference in Multan had sent shockwaves when he announced that New Delhi was planning more military action against Pakistan in the third week of April and called on the international community to reprimand India for its irresponsible conduct. "I am speaking responsibly, I hold a position of responsibility, and I know the words I utter will be picked up by theinternational media," Qureshi had said. Pakistan says it doesn’t want to affect Indian general election in any sense. “India has always been reluctant to come to the dialogue table because of reasons only known to the Indian side”, he added. The spokesperson said that Pakistan repeatedly raised the Kashmir issue on every international forum, including UNSC. “We impress upon the international community to urge India, by all means possible, to immediately halt the human rights violations in the IHK and seek their help in resolving the Jammu and Kashmir dispute,” he added. Meanwhile, the Indian High Commission on Thursday was handed over a further set of questions regarding the Pulwama terrorist attack in response to a dossier on the subject given to Pakistan by New Delhi. A response is awaited, said the spokesman. “Islamabad awaits the Indian response to the questions shared with them and New Delhi has so far not provided any actionable intelligence that could lead to Pakistan’s involvement in the Pulwama incident in which over 40 Indian paramilitaries were killed,” said the spokesman. As Indian Prime Minister Narendra Modi announced the scrapping of Article 370 of its Constitution that guarantees autonomous status to IHK, the spokesman said Pakistan completely rejects it. This opinion was also reflected in statements from the valley from a cross section of Kashmiri political leaders. “Kashmir could be resolved only according to UN Security Council resolutions and aspirations of Kashmiris,” he added. As the Afghan Taliban and the United States prepare for another round of talks in Doha, from April 14-15, the spokesman said Pakistan would not be attending these talks. “Dialogue is a good way of resolving all outstanding conflicts. Pakistan has supported peace talks in the past and believes that an Afghan led, Afghan owned government was the only solution to Afghan issue,” he added.